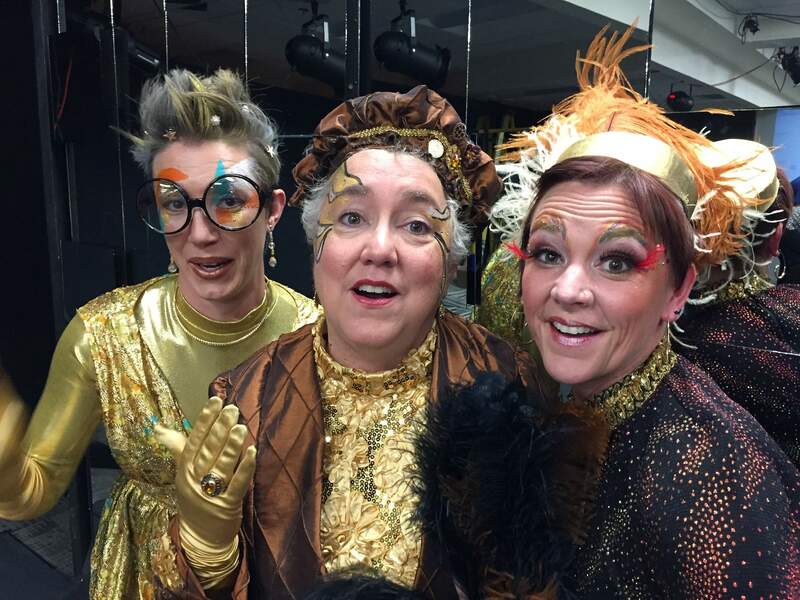 We should be so lucky to have three life guides like Mrs. Whatsit (Mandy Gardner), Mrs. Who (Sarah Choszczyk) and Mrs. Which (Helen Jauregui). In Madeleine L’Engle’s sci-fi fantasy A Wrinkle in Time, the three odd sisters appear to be kind neighborhood ladies. But in this spellbinding rescue story, they turn out to be something quite different. Opening tonight (Friday), “Wrinkle” will be presented by Merely Players through Dec. 10, in a bank on Durango’s Main Avenue. And talk about a local theater company with community interest at heart. Wood-Patterson and her creative team have chosen a popular play based on a popular book for its December slot. The intergenerational production features a large local cast and crew plus the special-effects wizardry of Charles Ford. “Wrinkle” tells the story three children who cross the barriers of time and space on a rescue mission. Meg Murry, a smart but struggling teenager, who with her younger brother, Charles Wallace, sets out on an adventure to find their scientist father. Dr. Murry disappeared years ago researching Camazotz, a mystery planet ruled by an evil, disembodied brain called simply – IT. Meg and her brother are joined by an older school friend, Calvin O’Keefe. Published in 1962, L’Engle’s book soon became a popular phenomenon. One of the prolific author’s 60 books, the story has been adapted for the stage, turned into a TV show, and in March 2018, Disney will premiere its multimillion-dollar film starring Reese Witherspoon, Oprah Winfrey and Mindy Kaling as the three supernatural guides. It will capitalize on special effects, but so do stage productions that have popped up all over the country since the book became an American favorite. “Wrinkle” mirrors Campbell’s pattern as Meg strongly feels the urge to leave home and rescue her father. She and her two companions discover mentors, confront obstacles, pass through a threshold, endure a frightening ordeal and eventually master the task. At the end, a return home signals achievement, and The Hero is older, wiser and stronger. Merely Players’ three leads have been double-cast: Meg (Abbie Albert and Anna Klumpenhower), Charles Wallace (Andre Craig and Jake Washburn) and Calvin (Ethan Craig and Anthony Berger). The rest of the cast will be familiar to Durangoans as they are all community actors. Wood-Patterson’s experienced creative team, which includes a dream technical crew, has turned the Bank of Colorado’s large meeting room into shifting realities. Yes, it’s a production not to miss. Many performances have sold out, but there’s still a wrinkle of a chance to get a ticket. What: “A Wrinkle in Time,” a fantasy-drama based on a book by Madeleine L’Engle, adapted by James Sie. Merely Players, directed by Mona Wood-Patterson. When: 7 p.m. Dec.1, 2, 7, 8 and 9, with 2 p.m. matinees Dec. 2, 9 and 10. Where: Bank of Colorado, 1199 Main Ave.
Tickets: $25. Available at Durango Welcome Center, Main and Eighth Street. For more information, call 247-7657, visit www.durangoconcerts.com or www.merelyplayers.us.